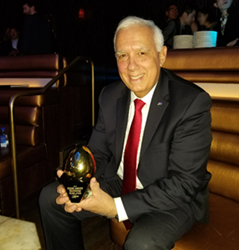 Purolator International President John Costanzo holds the company's 2018 Eggie Award for Best International Logistics Partner. This is the third consecutive year Purolator International has received this award, recognizing Purolator’s employees across the U.S. and Canada for providing an outstanding delivery experience for Newegg’s Canadian customers. Purolator International, a leading provider of North American logistics, is honored to have won a 2018 Eggie Award as Newegg’s Best International Logistics Partner. This is the third consecutive year Purolator International has received this award, recognizing Purolator’s employees across the U.S. and Canada for providing an outstanding delivery experience for Newegg’s Canadian customers. Newegg, the leading tech-focused e-retailer in North America, celebrates the Eggie Awards each year at the Consumer Electronics Show in Las Vegas, Nevada. Now in its 14th year, the coveted Eggie Awards recognize outstanding contributions from the company’s valued partners, vendors and customers. The 2018 Eggie Awards gala was hosted in the Omnia Nightclub at Caesars Palace Las Vegas on Jan. 11.